I tested out this technique by making these little trial paintings on cardboard. You can also watch it on video and listen to me talk through the process. I had primed the cardboard with gesso and cut it down to postcard size pieces. I made two flower paintings and one beetle painting to use as cards. I used Mont Marte charcoal pencils* and charcoal sticks. The difference is that the charcoal pencils have a wood case like pencils do, so they won't smudge your hand or fingers as much. And the pencils I used also have three different softnesses: hard, medium and soft. You can sharpen them, although the tips broke easily when I sharpened them. You can also use a knife and a sanding block for sharpening charcoal pencils. If you're looking for charcoal drawing materials, check out this blog post about the Crelando charcoal set. 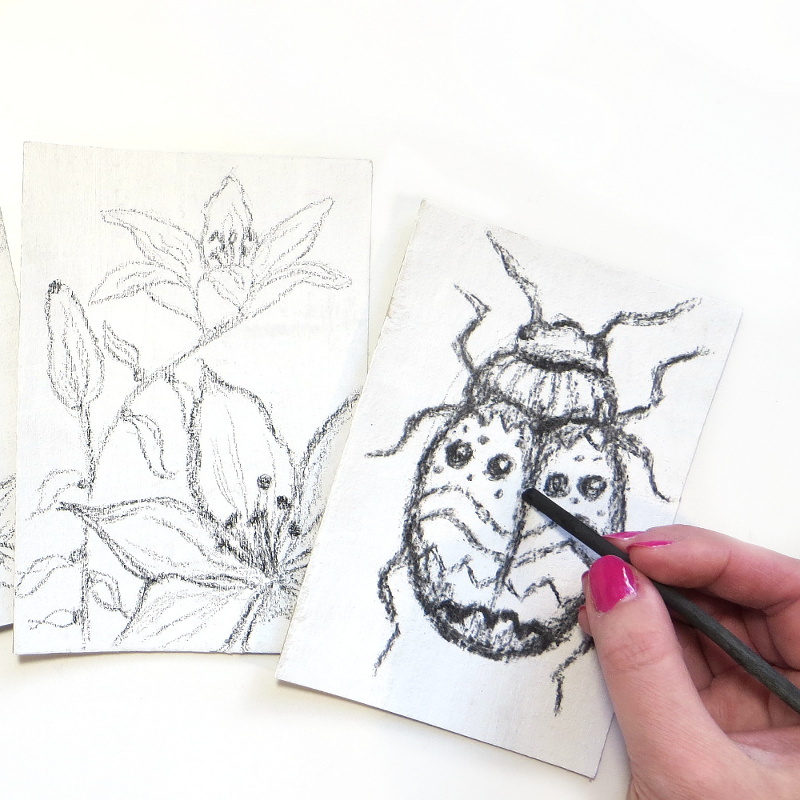 I started by sketching the flowers and beetle with charcoal pencils and charcoal sticks. I used my previous sketches as references for the freehand flower drawings. And I got the reference for the beetle shape from an insect book and then drew these zigzag shapes and circles on it to give it a tribal like pattern. The more opaque colors, like the lilac and fuchsia, are Plus Color acrylic paints. 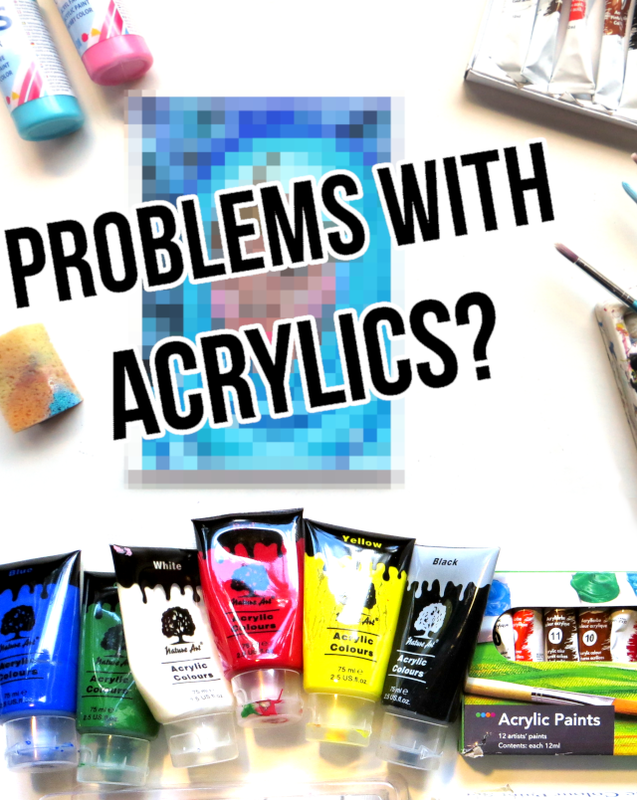 Many of my (Crelando and Nature Art) acrylic paints are already transparent, but I wanted to make sure the charcoal lines would show through and watered down the acrylics. I was kind of disappointed with this technique at first, because the charcoal mixed with the acrylics and turned the colors grey, but I found an answer to this issue with the third painting. I added thicker strokes of undiluted acrylic paint to add some brightness and to make the paintings more interesting. 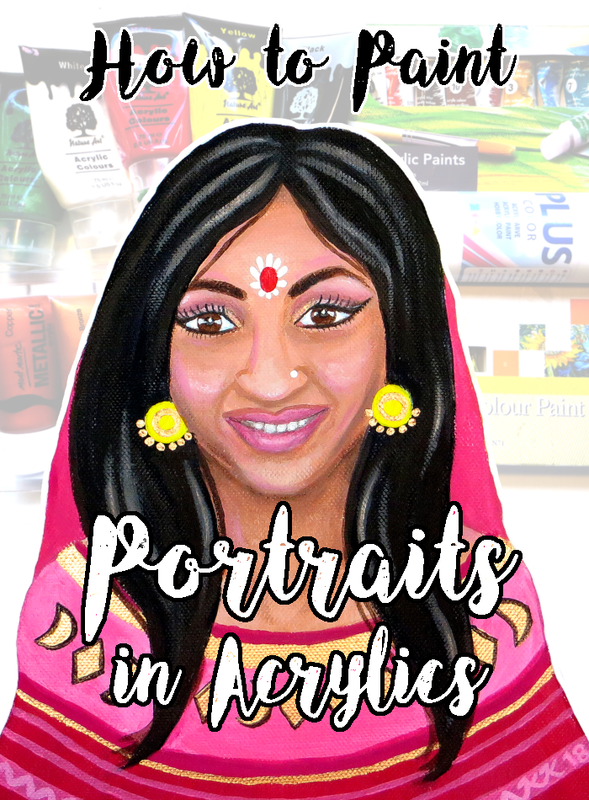 I tried to narrow down the colors to red, pink or fuchsia, purple and blue with a green background in the first painting and some white highlights. When they were dry, I added more charcoal lines. And as two of the paintings were Mother's Day cards, I wrote the wishes on the back with black acrylic ink* and a dip pen. I added some metallic acrylics on top of the beetle's patterns to make it shiny. For the last painting I wanted to make sure the charcoal would not mix with the acrylics. I tested if it makes a difference whether I dilute the acrylic with water or not. It didn't, the charcoal lines blended either way. I wanted to paint the beetle's background turquoise. The Plus Color turquoise* acrylic paint is pretty opaque so this time I diluted it with matte medium, which is kind of like colorless acrylic paint. The charcoal lines still blended with the paint. Finally I decided to try fixative to preserve the charcoal patterns on the beetle. I sprayed the drawing with fixative outside and then let it dry for a while, before painting over the beetle with matte medium*. The lines still spread a bit, but I thought this method was better than my previous tries. After the matte medium was dry, I painted over the beetle normally with thinner and thicker layers without worrying about the charcoal lines anymore, since they were sealed under the matte medium. Prints, stickers, postcards and more products with the tribal beetle are available in my shop! I painted a thin coat of blue so the lines would show through it and then added metallic acrylics for the patterns and a bit more turquoise. I was really happy with this last painting and I want to make more paintings with a similar style and topic. 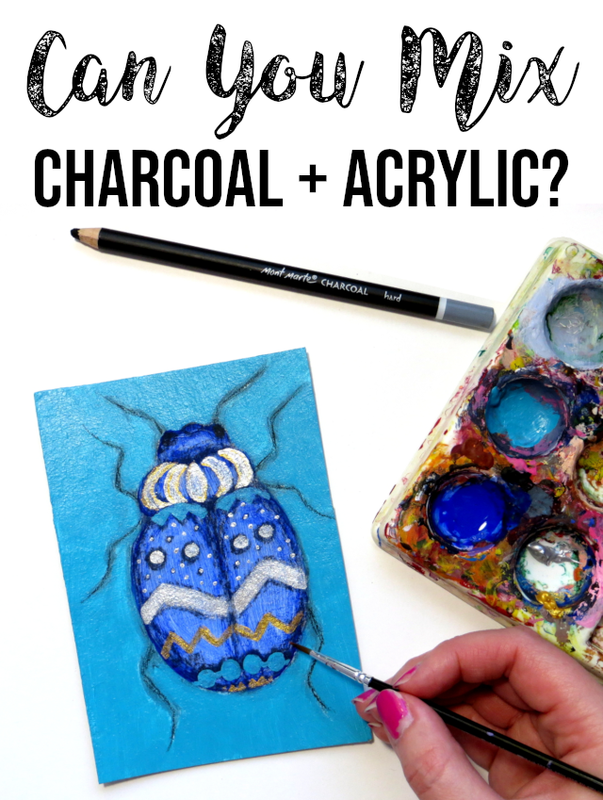 To recap, if you want to paint acrylic over charcoal without them mixing together, try sealing the charcoal drawing with something like fixative and matte medium first. 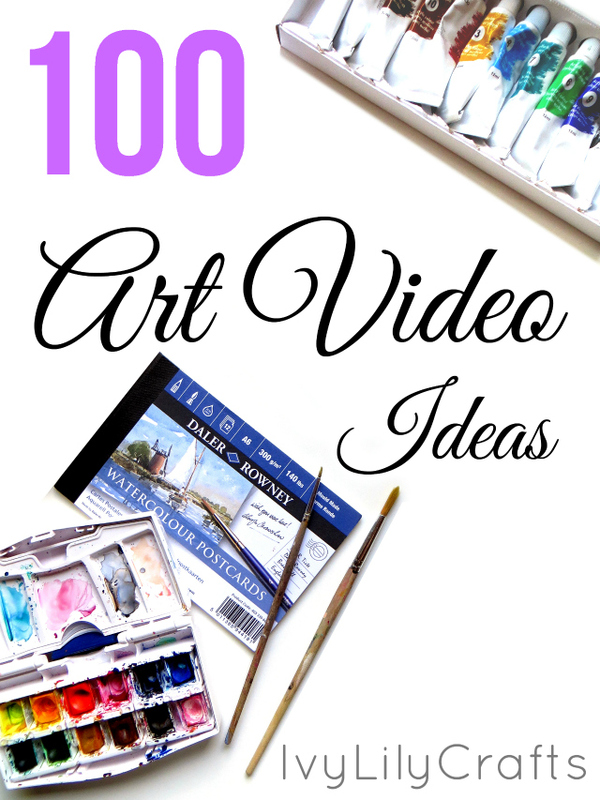 What's your favorite mixed media technique? Tell me in the comment section!